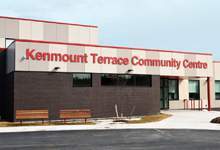 The Kenmount Terrace Community Centre and Park at 85 Messenger Drive will be opening to the public soon. Mon. April 15 - 6 to 8 p.m.
Wed. April 17 - 7 to 9 p.m.
Mon. April 29 - 2 to 4 p.m.
Tues. April 30 - 6 to 8 p.m. The public is encouraged to attend one of the drop-in sessions or visit the project page on engagestjohns.ca to learn more about the Kenmount Terrace Community Centre and Park and to let City staff know the programs and services you’d like to see offered there.